First things first. I take back my claim that it is one of the worst films of the year. Seeing a second time I realize that the film is self isn't bad and I know why I really didn't like it the first time out of the chute. The film is actually way better than I thought it was two years ago. Its is a visually impressive film that really is worth your time (provided you're aware of one problem see below). The film is getting a special one day screening on the 12th and I'm trying to work out how to take my niece to see it. Set on a world where living temples literally walk across the world dragging the moon and sun across them the time has come to pick new guardians of the moon and sun. The choices are all but formalities- choices that have been compromised by a former guardian who was long ago corrupted and is now living in the fiery underworld plotting revenge. When the gentle forest creature named Mune is chosen as the guardian of the moon, carefully laid plans are shaken up and chaos results. If you're an adult there is no doubt that we’ve been here before. The clash of good and evil and all of that has been done in any number of movies. While that might have been a bad thing in most other cases it really doesn't matter because not only are the visuals are so incredibly strong that they over whelm any reservations, but the film has sch neat details that you want to know ore. From the day people and the night people and the middle people who are made of wax this is just so incredibly cool. I love the little fire beasties and the giant creatures which drag the sun and moon across the world. The design and detail simply had my jaw hanging open. There however one problem with the film. 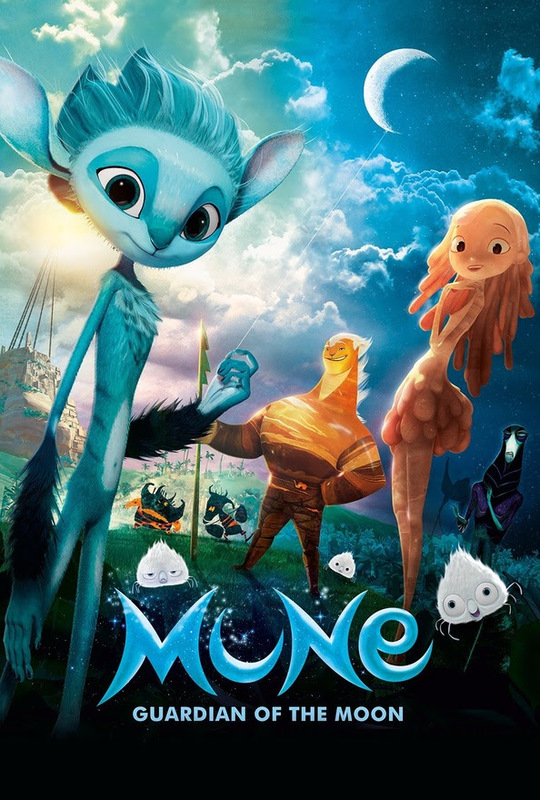 When I originally saw MUNE I really didn’t like the film. I thought that it was because of the story being done to death, but upon seeing the film again this past December in order to do an Oscar piece I realized that what I hated about the film was that the English voice cast isn’t all that good. Yes they are serviceable but they are unremarkable and sound more often than not like they are doing schtick instead of playing characters. They are not on the same level as everything else in the film.What pushed me over the edge was one actor was doing a poor Patrick Warburton. To me it was a lazy choice especially where the rest of the film isn't lazy. Seeing the film a second time I softened and I realized English voice cast side this is a really good film and worth seeing- especially if you can see it on a big screen- which you can do on Saturday when it plays in theaters across the country as a Fathom event. Take your kids and go and see something that will stay in their heads forever. For tickets go here.